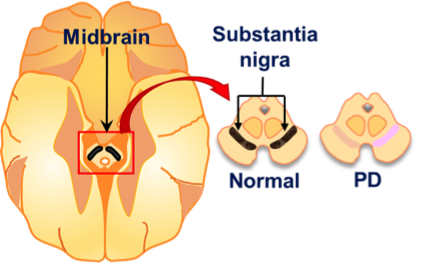 The movement disorder in Parkinson's disease (PD) is caused by a loss of dopamine neurons from the substantia nigra. 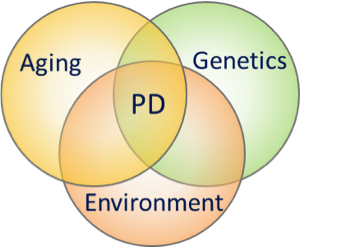 PD is a complex multifactorial disease with roots in genetics, aging and the environment. Genetic mutations that result in PD provide important clues into the molecular basis of disease development and form the foundation of the work performed in our laboratory. ​Mutations in LRRK2 (leucine-rich repeat kinase 2) are commonly found in both familial and sporadic PD. A number of disease-linked mutations increase LRRK2 kinase activity and multiple lines of evidence indicate that LRRK2-mediated neurodegeneration is kinase-dependent. The common G2019S LRRK2 mutation stimulates cap-dependent and cap-independent translation and results in elevated bulk mRNA translation in Drosophila via hyper-phosphorylation of ribosomal protein s15. Importantly, blocking the effect of mutant LRRK2 on translation via phospho-deficient T136A s15 (Fig. 1) or treatment with protein synthesis inhibitors effectively reduced age-related neurodegeneration in aged flies. These findings establish a clear link between elevated mRNA translation and PD phenotypes in vivo. A number of exciting questions arise from these observations that we aim to tackle in future experiments including: (i) How does the impact of mutant LRRK2 on mRNA translation lead to neuronal dysfunction and death? (ii) Does LRRK2 affect translation through other pathways with known roles in translation regulation? (iii) Does the metabolic regulation of mRNA translation influence age-related dopamine neuron viability consistent with its established effects on organismal aging? One of the main in vivo PD models used in our laboratory ​is the fruit fly Drosophila melanogaster. Flies have emerged as a powerful and genetically tractable model organism for investigating PD-related phenotypes. Many critical molecular insights into neurodegeneration and in particular PD have originated from the fly. In addition to the extensive conservation of gene and nervous system function shared between flies and vertebrates (including humans), fly brains possess a number of dopamine neurons that are important in the control of movement. Flies are versatile and their short life span makes them amenable to rapid modeling of aging and age-related diseases such as PD.